Southern University at New Orleans (SUNO) Track Team brought home four National Championships and 14 All-Americans from the 2017 NAIA Outdoor Track & Field Women’s National Championships May 25-27 in Gulf Shores, AL. Southern University at New Orleans (SUNO) will confer an Honorary Doctor of Humanities degree for Katherine Johnson, a physicist and mathematician who made contributions to the U.S. space program, Saturday, May 13, 2017 at 4 p.m. in the Lakefront Arena. The Commencement speaker is WWL-TV’s Sally-Ann Roberts. The New Orleans City Council recognized the Southern University at New Orleans (SUNO) Track Team in City Hall Thursday, May 4, 2017 for its success at the 2017 Indoor Track & Field National Championships in Johnson City, TN in March. The Team also performed well at the Gulf Coast Athletic Conference Men’s and Women’s Outdoor Track and Field Championship in New Orleans last month. Southern University of New Orleans (SUNO) has been named the Tom Joyner Foundation “School of the Month” for February 2017 as part of a month-long campaign to raise money for scholarships to help students at the Historically Black College and University. 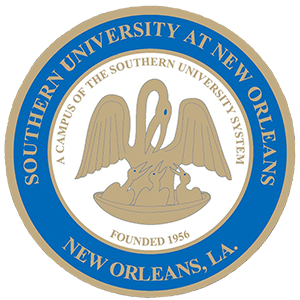 Southern University at New Orleans has scored 100 percent in all four performance standards of the Louisiana Granting Resources and Autonomy for Resources for Diplomas (GRAD) Act for Year 6. With these final Year 6 results, SUNO has met and/or surpassed the targeted measures for each year of the six-year performance objectives of the Act. Southern University at New Orleans had its most successful trip to the NAIA Outdoor Track & Field Championships in more than two decades, finishing fourth overall and producing two national champions. The U.S. Track & Field and Cross Country Coaches Association (USTFCCCA) has named Lady Knight Orenthia Bennett the South Region Track Athlete of the Year. A junior from Treasure Beach Jamaica, Ms. Bennett s the top-ranked athlete at 400 meters (54.16). She will be the favorite to win the event at the NAIA Championships starting Thursday in Gulf Shores, AL. Dr. Lisa Mims-Devezin has been appointed the Interim Chancellor of Southern University at New Orleans (SUNO), effective July 1, 2016. Dr. Mims-Devezin will fill the position left vacant after Chancellor Victor Ukpolo steps down June 30. La. Gov. John Bel Edwards is the guest speaker for the 2016 Southern University at New Orleans Commencement at 4 p.m. Saturday, May 7 in the Lakefront Arena. This year’s ceremony will be Chancellor Victor Ukpolo’s last. After leading the University for 10 years, Ukpolo will step down as Chancellor on June 30.